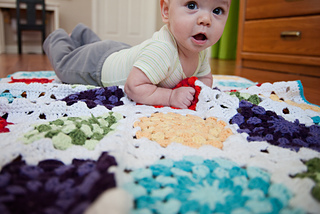 Babies are a great time to look at family traditions and then make them your own in your growing family. 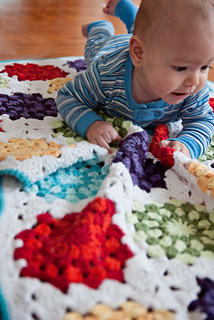 Growing up there always seemed to be a handmade blanket whenever you needed some extra warmth. 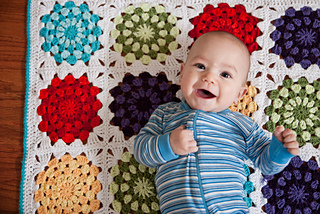 The most common kind was granny square blankets in a single neutral color. 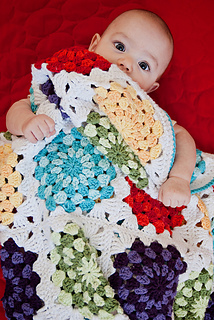 For my second baby I wanted to make him his own granny square blanket. 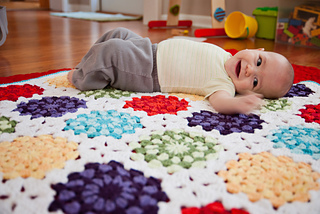 I wanted more color than my grandmothers so I modified the traditional sunburst square to have larger spots. Larger spots meant larger squares which coincidentally lead to less seaming. Seaming is the last thing I wanted to do while pregnant.